Home Deep Conditioners Go Green Recipes Mixology Oils 8 Coconut Oil Conditioner and Moisturizer Recipes! 8 Coconut Oil Conditioner and Moisturizer Recipes! 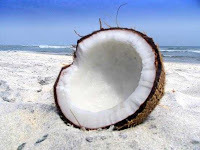 Below are some recipes for conditioners and moisturizers involving coconut oil. Give them a try and see what works for you! Break the shea butter into small pieces and place in a bowl. Using a hand mixer, whip the shea butter until fluffy and the chunks are gone. (If your shea butter is too hard, melt it only slightly to soften it a bit.) Add in melted mango butter and whip. Finally, add in the remaining ingredients and mix thoroughly with the hand mixer. Finito! Mix ingredients in bowl. After shampooing, massage all conditioner into hair and leave on for 30 minutes before thoroughly rinsing. Dissolve amino acids in water and mix with the tofu. Add aloe vera and oil and blend. Apply to dry hair that is to be washed. Cover hair. Leave on for 30 mintues. Add coconut oil. Leave on for 10 minutes. Wash andd condition and detangle and style as usual. Combine all ingredients together in a food processor or blender. Cut up one avocado, mash with a mixing spoon, and put in blender. Add about 1/3 to 1/2 cup of unrefined shea butter to blender. (No need to melt the shea butter ahead of time.) Finally add approximately 1/4 cup of extra virgin olive oil (EVOO) to blender and 2 tbsp of extra virgin coconut oil. If you wish, add 2-3 tablespoons of apple cider vinegar (ACV) to blender. (The ACV will aid in the blending process and adjusting pH.) Blend all the ingredients thoroughly and continue to add EVOO until the mixture reaches your desired consistency. When done, pour mixture into a bowl and apply to hair as a detangling deep conditioner. NOTE: It is important to blend the ingredients well to eliminate avocado bits that stick to the hair. If necessary, sieve the mixture before applying. Pour all ingredients into a spray bottle, and shake vigorously to blend. Store in a refrigerator until ready for use. Shake before each use. SHELF LIFE: ~2 weeks.